On the heels of his victory over Dalton Roberts (NYAC/OTS) in the U23 Trials final last June, Randon Miranda (NYAC/OTS) seemed fully committed to 60 kilograms through the remainder of the quad. But things changed for the Californian on Thursday, because in a surprising twist, Miranda was back down at 55 kilos, the weight class once deemed to suit him best and where he took third at the ’18 US Open. Day 1 of the 2019 Dave Schultz Memorial International in Colorado Springs began at 9:30am (MT) earlier today and streamed live in the US on FLOWrestling. 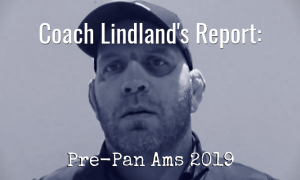 Miranda hadn’t weighed in at 55 kilograms since last April but there was no sign of a bad cut on Thursday, as he quickly knifed his way through the round-robin bracket with three tech-falls. 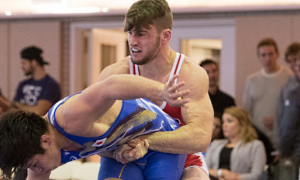 Later this evening, Miranda faces teammate and fellow 2018 U23 World Team member Dalton Duffield. Should he defeat Duffield, Miranda will be crowned the tournament champion. But don’t get used to Miranda sticking around at 55. Despite the dominant performance he has put forth thus far, he insists this is a one-shot deal. “I swear, before I left I was 62 kilos,” Miranda said. “We fly out and I’m thinking I’ll just hang out a bit, I didn’t have to work out too much. I did a little 20 minute run, I are — ice cream — and went to bed. I woke up the next day and I was 57 kilos. I was freaking out. Naturally, I’ve never woken up that light. 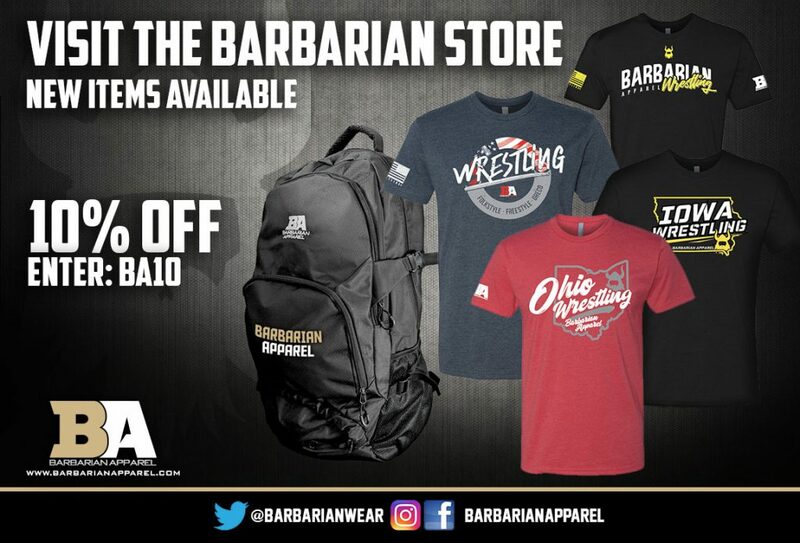 2018 World Team member Roberts doesn’t appear to have a shortage of rivals these days. Making his first appearance of the season, the Northern wrestler opened with a tech over Ty Pelot (X-Factor Elite) that set up another go-round with stout WCAP rep Mike Fuenffinger. The pair first met at the Winter 2017 version of the Schultz, with Fuenffinger coming out on top. Roberts got him back several months later in the University National final, and then again last year in their memorable US Open final. Their semifinal meeting today might not have eclipsed their 2018 bout, but it came close. Roberts got off to a hot start, racking up six straight points. Fuenffinger closed the gap to 6-4 entering the second; with the score at 7-7 late in the period (Robert’s had criteria), Fuenffinger executed an arm throw for two, stealing the lead. Roberts immediately reversed position — and came close to getting around on a takedown with time running out — but the score didn’t change. Fuenffinger has another Open rematch on Thursday: he meets 2008 Olympian and WCAP teammate Ildar Hafizov in the 60-kilogram final. Roberts goes for third against Pelot. 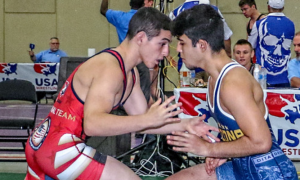 2014 University World bronze Sammy Jones (NYAC/OTS) is looking for his first Dave Schultz Memorial gold, and will be doing business opposite former NMU training partner Travis Rice (IRTC). Rice started his day with a tough victory over Marine Colton Rasche, who bowed out of the tournament due to injury. 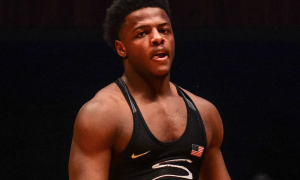 As for Jones, he didn’t get the chance to wrestle Rasche, but he did crack open his morning with a tech fall over Luis Hernandez (NYAC/FLWC). Once again, last year’s US Open comes into play — Jones defeated Rice at the Vegas event a year ago. 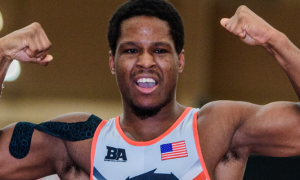 Jamel Johnson (67 kg, Marines), who returned to Greco following a brief hiatus at this very event last November, sailed to tonight’s finals via tech wins at the expense of US Open runner-up Jessy Williams (NYAC/FLWC) and 2018 Junior Trials champ Benji Peak (Sunkist/OTS). In the battle for gold, he will greet Egypt’s Mostafa Mohamed, who snared victories over US star Jesse Thielke (NYAC/LOG) and Austin Morrow (NYAC/OTS). 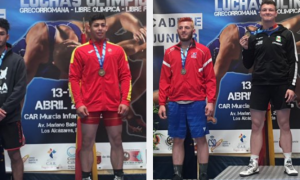 Ray Bunker (72 kg, Marines) is on the cusp of adding a second international gold to his resume. 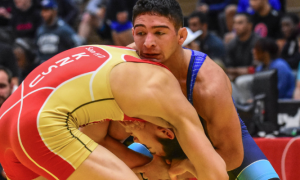 But first he’ll have to contend with Uzbekistan’s Asror Mukhitdinov, who himself had himself a day thanks to a pair of impressive triumphs over the likes of Britton Holmes (NMU/OTS) and Anthonie Linares (NYAC/LOG), respectively. 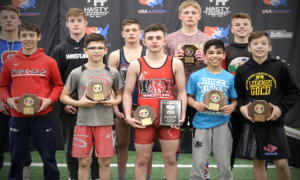 Bunker, who scored a bronze in Russia this past fall, won the 2018 Bill Farrell Memorial and was also recently named 5PM’s Impact Performer. The finals and bronze medal matches for Day 1 of the 2019 Dave Schultz Memorial begin this evening at 7:00pm (MT).